This is the CellML description of Chang and Fujita's 1999 numerical model of the renal distal tubule. It should be noted that the initial conditions used in this description represent those in the early distal tubule. For model representations of the late distal tublule, these initial values should be replaced with those listed in the orginal paper for the late distal tubule. The model from the original paper has been modified slightly to include differential equations defining the change in solute concentrations over time. These equations were added to facilitate the use of the CellML code in CMISS. Note that the model is not running correctly in COR or OpenCell and there are unit inconsistencies. ABSTRACT: A numerical model of the rat distal tubule was developed to simulate water and solute transport in this nephron segment. This model incorporates the following: 1) Na-Cl cotransporter, K-Cl cotransporter, Na channel, K channel, and Cl channel in the luminal membrane; 2) Na-K-ATPase, K channel, and Cl channel in the basolateral membrane; and 3) conductances for Na, K, and Cl in the paracellular pathway. Transport rates were calculated using kinetic equations. Axial heterogeneity was represented by partitioning the model into two subsegments with different sets of model parameters. Model equations derived from the principles of mass conservation and electrical neutrality were solved numerically. Values of the model parameters were adjusted to minimize a penalty function that was devised to quantify the difference between model predictions and experimental results. The developed model could simulate the water and solute transport of the distal tubule in the normal state, as well as in conditions including thiazide or amiloride application and various levels of sodium load and tubular flow rate. Transport mechanisms of model tubule. 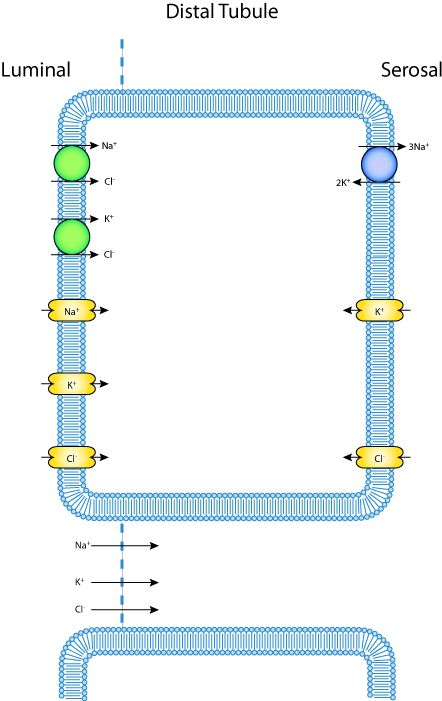 In the luminal cell membrane, there are Na-Cl cotransporter, K-Cl cotransporter, Na channel, K channel, and Cl channel. In the basolateral cell membrane, there are Na-K-ATPase, K channel, and Cl channel. In the paracellular pathway, which faces luminal and basolateral compartments, there are conductances for sodium, potassium, and chloride. Axial heterogeneity of the distal tubule was represented by changing the model parameters in the early and the late parts of the model tubule. Derived from workspace Chang, Fujita, B, 1999 at changeset d9a44ca71a03.